At Petree & Stoudt, most of the parts we make are Milled, Turned, or both. We also perform secondary milling and turning operations on cast parts, laser or water-jetted parts, custom extrusions, and welded assemblies. 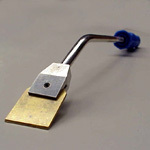 Browse through some sample parts below, categorized by their primary machining process. We can turn parts to within 0.0005" in diameter out of bar stock, tubing, spun parts, or castings. 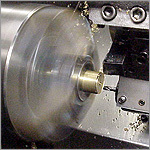 View our turning equipment list, or take a tour of our shop. 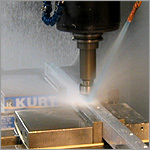 We can mill, drill, tap, and deburr parts in a single CNC program. Aluminum, brass, steel, or plastic, we can shape just about anything. View our milling equipment list, or take a tour of our shop. When you need complete assemblies, call us! Some of the samples shown are P&S products currently available for purchase.